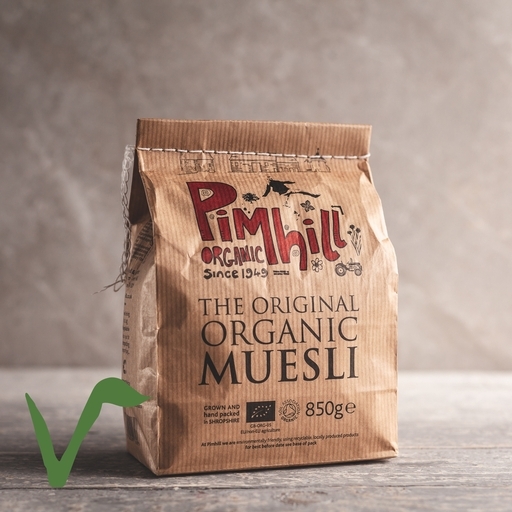 Pimhill’s original organic muesli. A traditional soft muesli packed with porridge oats, jumbo oats, wheat flakes, dried fruit, nuts – and no added sugar. If a bowlful of this doesn’t get you going in the morning, nothing will. Serve with milk or yogurt, or try it in flapjacks or simmered into creamy porridge. A fantastic product from a mixed dairy and arable farm in Shropshire. Pimhill was converted to organic farming methods in 1949 by father and son, Sam & Richard Mayall. Sam also became Vice president of the Soil Association. The farm is now run by Ginny Mayall, Sam's granddaughter and they continue to supply independents with oats and flour.